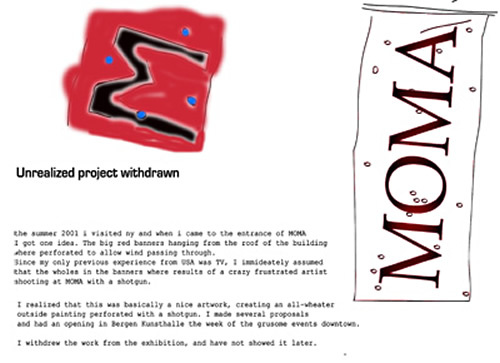 The summer of 2001 I visited New York, and when I came to the entrance of MOMA, I got one idea. The big red banners hanging from the roof of the building were perforated to allow wind passing through. But since my only previous experience with USA was TV, I immediately assumed that the wholes in the banners, were results of a crazy frustrated artist that had shot at MOMA with a shotgun. I realized that this basically could be a nice artwork, creating an all-wheater outside painting perforated with a shotgun. I made several tests and proposals and had an opening of a show in Bergen Kunsthall the week of the 9/11 events. I withdrew the works from the exhibition.